"A roughly N-S vein appears to have been tried near the head of the gill [NY307324]. The vein is predominantly of a hard gossany nature with spongy quartz impregnated with iron and manganese oxides. The locality is well known as a source of good, though small, crystals of pharmacosiderite. Several other arsenates and phosphates occur here and the locality has received a good deal of attention from collectors." 29 valid minerals. 1 erroneous literature entry. Reference: Young, B. (1987) Glossary of the minerals of the Lake District and adjoining areas. British Geological Survey, Newcastle upon Tyne, 104 pp. ; Cooper, M.P. and Stanley, C.J. (1990) Minerals of the English Lake District: Caldbeck Fells. Natural History Museum Publications, London, 160 pp. (referring to Young, 1987). Description: Cooper & Stanley (1990): "Listed by Hartley (1984). Young (1987) was wrong to suggest that Hartley's record was a misprint for braunite (J. Hartley, pers. comm.)." Reference: Hartley, J. (1984) A list of minerals associated with the ore deposits of the Caldbeck Fells, Cumbria. Transactions of the Leeds Geological Association, 10(3), 22-39.; Young, B. (1987) Glossary of the minerals of the Lake District and adjoining areas. 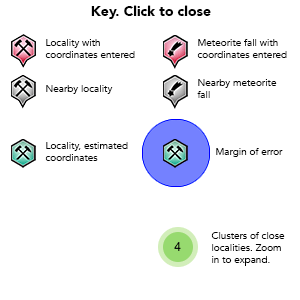 British Geological Survey, Newcastle upon Tyne, 104 pp. ; Cooper, M.P. and Stanley, C.J. (1990) Minerals of the English Lake District: Caldbeck Fells. Natural History Museum Publications, London, 160 pp. (referring to Hartley, 1984 and Young, 1987). 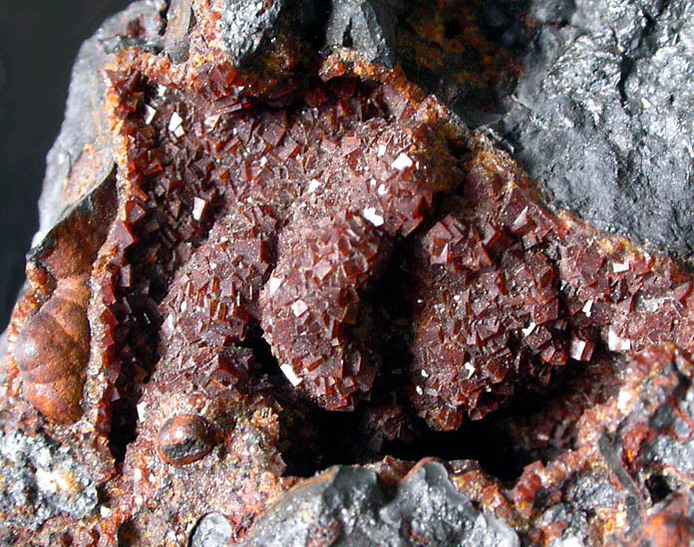 Habit: sheafy aggregates of acute rhombohedral crystals to 2 mm, partially embedded in massive beudantite on quartz; and minute (< 1 mm) brownish crystals of pseudo-octahedral aspect resulting from the equal development of the pinacoid and a rhombohedron. On this latter habit the rhombohedron faces are lustrous whilst the pinacoids are dull; these characters show that the habit is not an isometric octahedron (det. BM(NH): XRD). Description: Cooper & Stanley (1990): "Occurs in three forms on specimens collected by D.R. Middleton from dumps of the old workings near the head of the gill." Description: Cooper & Stanley (1990): "Listed in error for beraunite in Young (1987)." Description: Kingsbury reference? Cooper & Stanley (1990): "This appears to be the first published British occurrence of the species, although long-known from localities in Cornwall. 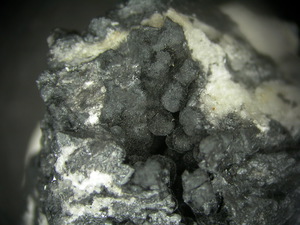 Specimens in the Kingsbury Collection, BM(NH), show yellow fibres of cacoxenite on a 'limonitic' matrix." Reference: Hartley, J. (1984) A list of minerals associated with the ore deposits of the Caldbeck Fells, Cumbria. Transactions of the Leeds Geological Association, 10(3), 22-39.; Young, B. (1987) Glossary of the minerals of the Lake District and adjoining areas. British Geological Survey, Newcastle upon Tyne, 104 pp. ; Cooper, M.P. and Stanley, C.J. (1990) Minerals of the English Lake District: Caldbeck Fells. Natural History Museum Publications, London, 160 pp. (referring to Hartley, 1984). Reference: Hartley, J. (1984) A list of minerals associated with the ore deposits of the Caldbeck Fells, Cumbria. Transactions of the Leeds Geological Association, 10(3), 22-39.; Cooper, M.P. and Stanley, C.J. (1990) Minerals of the English Lake District: Caldbeck Fells. Natural History Museum Publications, London, 160 pp. (referring to Hartley, 1984). Reference: Kingsbury, A.W.G. and Hartley, J. (1958) Jarosite and natrojarosite from the Lake District. Mineralogical Magazine, 31(240), 813-815.; Hartley, J. (1984) A list of minerals associated with the ore deposits of the Caldbeck Fells, Cumbria. Transactions of the Leeds Geological Association, 10(3), 22-39.; Young, B. (1987) Glossary of the minerals of the Lake District and adjoining areas. British Geological Survey, Newcastle upon Tyne, 104 pp. ; Cooper, M.P. and Stanley, C.J. (1990) Minerals of the English Lake District: Caldbeck Fells. Natural History Museum Publications, London, 160 pp. (referring to Kingsbury & Hartley, 1958, Hartley, 1984, and Young, 1987). Description: Kingsbury reference. Kingsbury & Hartley (1958): "in gossany vein-stuff from a north-south iron- manganese vein tried near the head of the Gill, 400 yards southwest of Coomb Height; forms compact brown crystalline masses and small (up to 2 mm.) 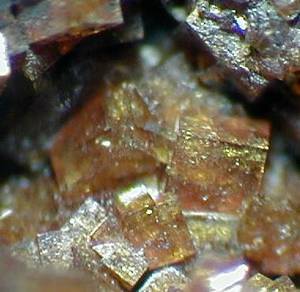 brown rhombohedral crystals on goethite and saccharoidal quartz. 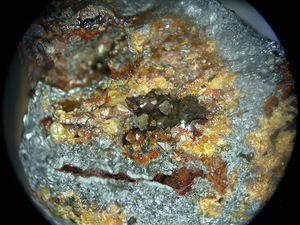 The crystals resemble brownish pharmacosiderite also occurring here (B.M. 1956, 78; 1958, 45). Reference: Kingsbury, A.W.G. and Hartley, J. (1958) Jarosite and natrojarosite from the Lake District. Mineralogical Magazine, 31(240), 813-815.; Hartley, J. (1984) A list of minerals associated with the ore deposits of the Caldbeck Fells, Cumbria. Transactions of the Leeds Geological Association, 10(3), 22-39.; Cooper, M.P. and Stanley, C.J. (1990) Minerals of the English Lake District: Caldbeck Fells. Natural History Museum Publications, London, 160 pp. (referring to Kingsbury & Hartley, 1958 and Hartley, 1984). Reference: Green, D.I., Bridges, T.F., Rumsey, M.S., Leppington, C.M., and Tindle, A.G. (2008) A review of the mineralogy of the Roughton Gill Mines, Caldbeck Fells, Cumbria: Part 2 The Roughton Gill South Vein on Balliway Rigg. Journal of The Russell Society, vol. 11, 3-28.; Tindle, A.G. (2008) Minerals of Britain and Ireland. Terra Publications, Harpenden. Reference: Greg, R.P. and Lettsom, W.G. (1858) Manual of the mineralogy of Great Britain and Ireland. John van Voorst, London, ix, 483 pp. [facsimile reprint, with addenda, by Lapidary Publications, Broadstairs, 1977]. ; Hall, T.M. (1868) The Mineralogist's directory: or a guide to the principal mineral localities in the United Kingdom and Ireland. Edward Stanford, London, 168 pp. ; Davidson, W.F. and Thomson, N. (1951) Some notes on the minerals of Westmorland and Cumberland. North West Naturalist, 23 (for 1948), 136-154.; Cooper, M.P. and Stanley, C.J. (1990) Minerals of the English Lake District: Caldbeck Fells. Natural History Museum Publications, London, 160 pp. (referring to Greg & Lettsom, 1858 and Davidson & Thomson, 1951). Description: Cooper & Stanley (1990): "From the old workings at the head of the gill, as an almost phosphate-free variety in small crystals with pharmacosiderite etc. (R.S.W. Braithwaite pers. comm., det. University of Manchester Institute of Science and Technology (UMIST): IR)." Reference: Greg, R.P. and Lettsom, W.G. (1858) Manual of the mineralogy of Great Britain and Ireland. John van Voorst, London, ix, 483 pp. [facsimile reprint, with addenda, by Lapidary Publications, Broadstairs, 1977]. ; Hall, T.M. (1868) The Mineralogist's directory: or a guide to the principal mineral localities in the United Kingdom and Ireland. Edward Stanford, London, 168 pp. ; Goodchild, J.G. (1885) Contributions towards a list of minerals occurring in Cumberland and Westmorland [part 2]. Transactions of the Cumberland Association for the Advancement of Literature and Science, 9 (for 1883-1884), 175-199.; Davidson, W.F. and Thomson, N. (1951) Some notes on the minerals of Westmorland and Cumberland. North West Naturalist, 23 (for 1948), 136-154.; Kingsbury, A.W.G. and Hartley, J. 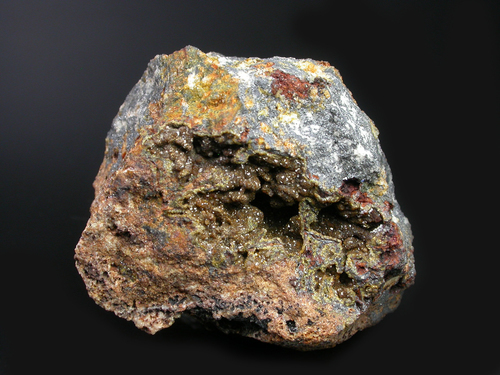 (1958) Jarosite and natrojarosite from the Lake District. Mineralogical Magazine, 31(240), 813-815.; Hartley, J. (1984) A list of minerals associated with the ore deposits of the Caldbeck Fells, Cumbria. Transactions of the Leeds Geological Association, 10(3), 22-39.; Cooper, M.P. and Stanley, C.J. (1990) Minerals of the English Lake District: Caldbeck Fells. Natural History Museum Publications, London, 160 pp. Reference: Hall, T.M. (1868) The Mineralogist's directory: or a guide to the principal mineral localities in the United Kingdom and Ireland. Edward Stanford, London, 168 pp. ; Hitchen, C.S. (1934) The Skiddaw granite and its residual products. Quarterly Journal of the Geological Society of London, 90, 158-200.; Kingsbury, A.W.G. and Hartley, J. (1958) Jarosite and natrojarosite from the Lake District. Mineralogical Magazine, 31(240), 813-815.; Cooper, M.P. and Stanley, C.J. (1990) Minerals of the English Lake District: Caldbeck Fells. Natural History Museum Publications, London, 160 pp. Description: Kingsbury reference. In the Kingsbury Collection (BM(NH)). Reference: Kingsbury, A.W.G. (MS1) (1953 or later) Investigation of the minerals of the Lake District, especially the Caldbeck area, in collaboration with J. Hartley. List of minerals found by us at many localities 1947-.; Young, B. (1987) Glossary of the minerals of the Lake District and adjoining areas. British Geological Survey, Newcastle upon Tyne, 104 pp. ; Cooper, M.P. and Stanley, C.J. (1990) Minerals of the English Lake District: Caldbeck Fells. Natural History Museum Publications, London, 160 pp. (referring to Kingsbury, 1953 and Young, 1987). Reference: Appleton, J.D. and Wadge, A.J. (1976) Investigation of tungsten and other mineralisation associated with the Skiddaw granite near Carrock Mine, Cumbria. Mineral Reconnaissance Prgramme. Report of the Institute of Geological Sciences No. 7.; Cooper, M.P. and Stanley, C.J. (1990) Minerals of the English Lake District: Caldbeck Fells. Natural History Museum Publications, London, 160 pp. (referring to Appleton & Wadge, 1976). Description: As 'brush-like clusters in quartz' (Hitchen, 1934: 186); in a vein at the foot of the gill (R.S.W. Braithwaite, pers. comm.). Reference: Hitchen, C.S. (1934) The Skiddaw granite and its residual products. Quarterly Journal of the Geological Society of London, 90, 158-200.; Cooper, M.P. and Stanley, C.J. (1990) Minerals of the English Lake district: Caldbeck Fells. Natural History Museum Publications, London, 160 pp. (referring to Hitchen, 1934). Description: From the vein in the north-east branch of the gill. Description: Cooper & Stanley (1990): "As small colourless to bluish crystals (Hartley, 1984). Young (1987: 98) describes a specimen in the BM(NH) as 'pale purple globules with goethite and cacoxenite." Description: Kingsbury reference? Cooper & Stanley (1990) only refer to specimens in the Kingsbury Collection (BM(NH)) and to Hartley (1984). Description: In stream sediments (Appleton & Wadge, 1976). In a roughly east-west trending, south dipping, iron-stained shear zone in the upper central tributary of Burdell Gill. The zone is about 300mm wide. (Neall & Leppington, 2003). Reference: Appleton, J.D. and Wadge, A.J. (1976) Investigation of tungsten and other mineralisation associated with the Skiddaw granite near Carrock Mine, Cumbria. Mineral Reconnaissance Prgramme. Report of the Institute of Geological Sciences No. 7.; Cooper, M.P. and Stanley, C.J. (1990) Minerals of the English Lake District: Caldbeck Fells. Natural History Museum Publications, London, 160 pp. (referring to Appleton & Wadge, 1976). ; Neall, T. and Leppington, C.M. (2003) New investigation of the mineralisation in Burdell Gill, Caldbeck Fells, Cumbria. Journal of The Russell Society, 8(1), 1-9. Greg, R.P. and Lettsom, W.G. (1858) Manual of the mineralogy of Great Britain and Ireland. John van Voorst, London, ix, 483 pp. [facsimile reprint, with addenda, by Lapidary Publications, Broadstairs, 1977]. Hall, T.M. (1868) The Mineralogist's directory: or a guide to the principal mineral localities in the United Kingdom and Ireland. Edward Stanford, London, 168 pp. Goodchild, J.G. (1885) Contributions towards a list of minerals occurring in Cumberland and Westmorland [part 2]. Transactions of the Cumberland Association for the Advancement of Literature and Science, 9 (for 1883-1884), 175-199. Kingsbury, A.W.G. (MS1) (1953 or later) Investigation of the minerals of the Lake District, especially the Caldbeck area, in collaboration with J. Hartley. List of minerals found by us at many localities 1947-. [An unpublished hardback notebook containing lists of species by locality with occasional notes and descriptive detail]. Kingsbury, A.W.G. and Hartley, J. (1958) Jarosite and natrojarosite from the Lake District. Mineralogical Magazine, 31(240), 813-815. Appleton, J.D. and Wadge, A.J. (1976) Investigation of tungsten and other mineralisation associated with the Skiddaw granite near Carrock Mine, Cumbria. Mineral Reconnaissance Prgramme. Report of the Institute of Geological Sciences No. 7. Young, B. (1987) Glossary of the minerals of the Lake District and adjoining areas. British Geological Survey, Newcastle upon Tyne, 104 pp. Green, D.I., Bridges, T.F., Rumsey, M.S., Leppington, C.M., and Tindle, A.G. (2008) A review of the mineralogy of the Roughton Gill Mines, Caldbeck Fells, Cumbria: Part 2 The Roughton Gill South Vein on Balliway Rigg. Journal of The Russell Society, 11, 3-28. Tindle, A.G. (2008) Minerals of Britain and Ireland. Terra Publications, Harpenden.